Zylofon Music’s only signed gospel artiste, Joyce Blessing, has taken Reverend Christian Kwabena Andrews popularly known as Osofo Kyiri Abosom to the cleaners for saying she is not an anointed musician of God. The musician who did not mince words said if there is any man of God is not anointed but pretending to be from God, it can only be Kyiri Abosom. The man of God on Saturday told GH Entertainment Show host, Prince Kwesi Dadzie that, Joyce Blessing is not from God. 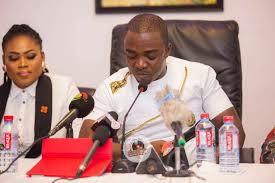 The man of God was reacting to jabs thrown at him by Joyce Blessing in 2018 after he had described Nana Appiah Mensah aka NAM 1 as an occult. Joyce Blessing at the time, lambasted the man of God and asked him to desist from tarnishing the image of her boss. But reacting to the jabs following the recent challenges facing NAM 1, the man of God asked Joyce Blessing and other signed artistes to go on their knees, pray for forgiveness because they have been cursed and under an evil spell for signing onto Zylofon Music. But Joyce Blessing who did not like the comments threw jabs at the man of God and wondered why he charges people before he pray for them. She went on to request her latest song ‘Repent’ for the man of God to listen and repent from his evil ways. She asked the man of God to stay in his lane and allow her to also stay in her lane and stop attacking her personality. ‘’Is he also from God? If someone searching for God and mercies come to your church and you ask the person to pay consultation fee, are you a man of God? Play Repent for him because the day Christ will return, he will account for his deeds,’’ she added. Joyce Blessing said she will not allowed any negative comments from any quarters to distract her. She was speaking to Sokoohemaa Kukua on the mid-morning drive on Rainbow Radio 87.5Fm.